In truth, I started my week off in a bad mood. I'm always the first to say, "stop with the negative talk", but today really hit me the wrong way. I felt off from the second I got out of bed and let it ruin me for a good portion of the day. Things just weren't going my way and well, yeah…I had a serious case of the Mondays. Well, I've decided enough of the negative talk. Somebody posted on my instagram feed that it's all in how you look at it and I'm going to make today better! I'm working on some new projects and I need to look at the adventure part of these things and embrace the change. Negativity only breeds more negativity…so, today, I choose happiness! I'm always so inspired with how Katie puts her positive foot forward. Thank you Katie for making me see the Marvelousness in my Monday! So, I've decided to share one of my favorite recipes as of late. I made this one up last week and have made it 4 times since. This should tell you how much my guys like it...before I could take a real picture, the container was empty and I was told that I needed to make more. This is more of a sweetened cereal than a true granola, in my opinion. You know the Honey Bunches of Oats cereal, well, this is kind of like that. I used Attune Foods cornflake cereal with some Bob's Red Mill oats and their new hazelnut meal/flour to make a super crunchy delicious cereal! This also works as a crunchy topping to baked goods or doughnuts (which is what I did with the picture above). So easy and so delicious! Happy Monday friends! I hope you're having a great one! YUM!!! 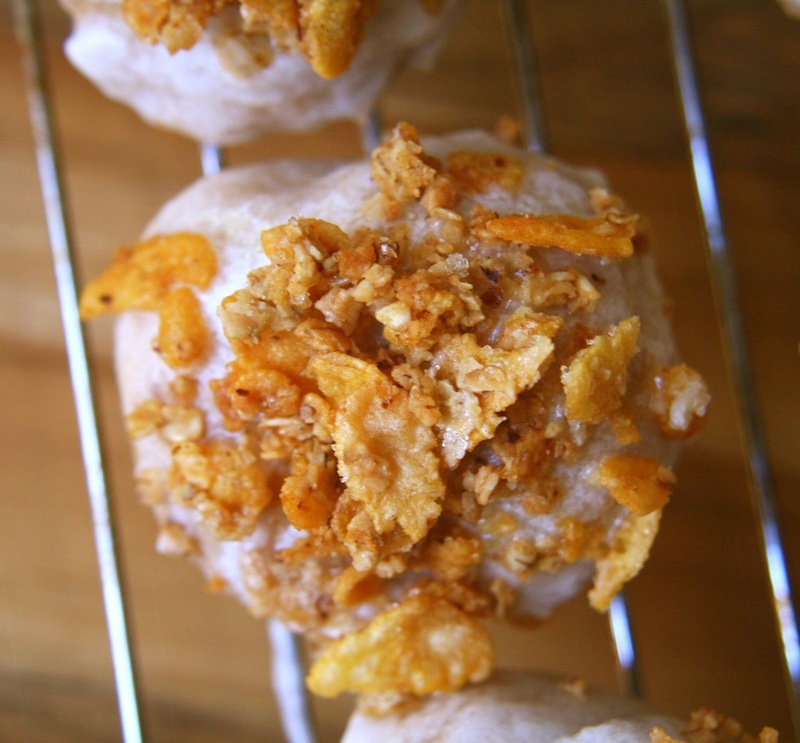 Honey Bunches of Oats was one of my staples in college...I will have to give this a whirl! YUM! That might cheer me up too ;-) Sorry you had a rough start my friend. Big hugs. I love corn flakes and I just got pecan meal at YDFM. This is calling me. Actually.. this would make a good waffle topping. Yet another reason I need a waffle maker. yes for no more negative self talks! we are doing our best to be more happy and positive! Oh my stars... that looks incredible! I have the quinoa and chia flakes... I'll have to try this with those! those corn flakes... still my favorite. this sounds so very good. This makes me wonder why granola has not been present in my life lately, yum! Aw, I'm so glad you have your game back on!! 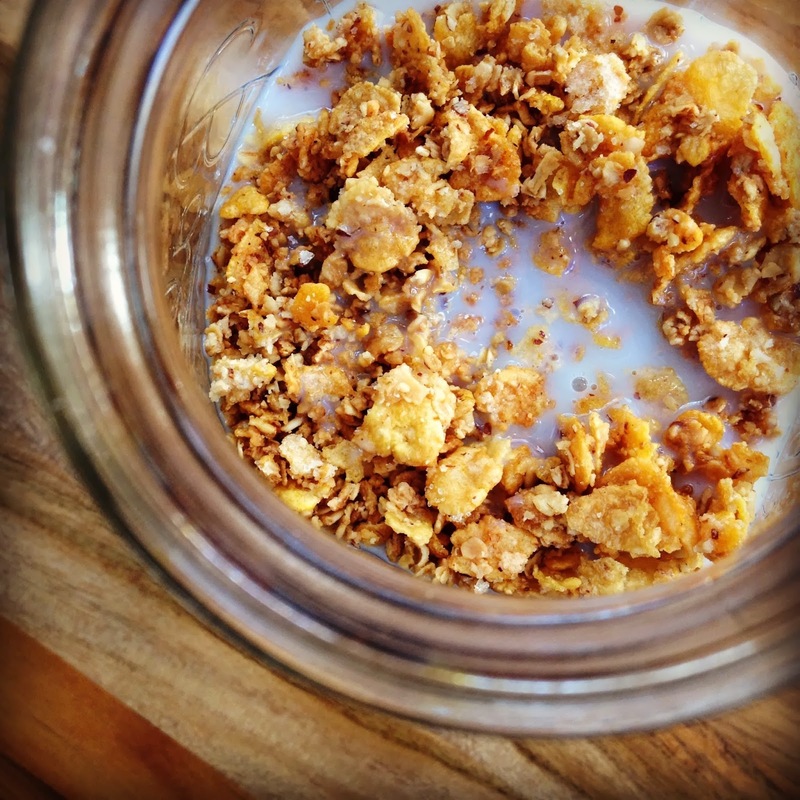 Love this recipe and in fact did a hazelnut meal granola myself!! Hope your week is going better. It's this cold weather. Once it gets nice out, I feel like everyone will be in a better mood! OOOH MY THURSDAY THANKS YOU FOR THIS! !